April 7, 2007 - Posted by	Phylameana lila Desy | Reiki Fun! Thank you so much for taking the time to post a comment. I love hearing that my book is making its way into the hands of your students. FYI – My daughter is an RN and a Reiki practitioner! She was my very first Reiki student when she was still in high school. I am a Reiki level II and a new professional life coach who would like to work with Reiki therapist. Nice cartoon. 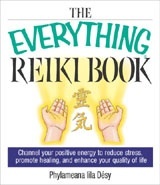 It brings up a good point though, so many people have never heard of Reiki and really have no idea what it is. The word is getting out though, and more and more people are learning the benefits of Reiki healing. I enjoy your blog site. I hope all is unfolding in your life in ease, joy, harmony, and abundance!! !